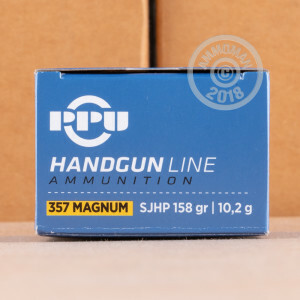 Suitable for a variety of purposes, these economical semi-jacketed hollow point rounds in .357 Magnum come from one of Prvi Partizan's three factories in Serbia. They are cheap enough to use as range rounds, but also perform well for hunting in a carbine as well as self-defense in a revolver. The medium weight 158 grain bullet produces the high velocities the .357 Mag is known for while delivering good penetration and expansion in the target. 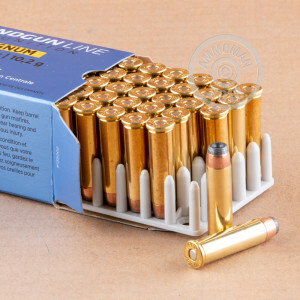 This ammo comes packaged in a 500 round case, with 10 boxes of 50 rounds each. Prvi Partizan uses non-corrosive Boxer primers and reloadable brass cases in all of its products. The price you see here includes free shipping from AmmoMan.com's warehouse to your doorstep. Our free shipping promotion applies to any order larger than $99, including virtually all 500 and 1,000 round cases.